SmartCryptoReader is a high-tech reader for access control systems. It has a Wiegand 34bit output interface which is suitable with all of the controllers with the same input. SmartCryptoReader works only with SmartCryptoCard, which are pre-coded with the security algorithm. This algorithm is special developed to protect the communication between the reader and the card. This contributes for high security from cloned cards and increases the services quality. The credit or impulses are loaded in the card by SmartCryptoUSB programmer reader and included software in the set. SmartCryptoCredit reader is locked personally for each client by a special algorithm and works only with special coded cards. When buying this kind of reader you get a master card with unique code. This code is used later for generating other cards or readers personally locked for you. This way you can be sure that other cards can not work with your reader and your system is fully protected. Connection with other devices by Wiegand 34 bit. SmartCryptoReader is a high-tech device with unique protection. 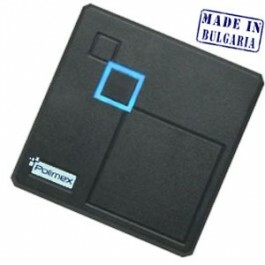 Very suitable for objects with high security level and prepaid services. The purpose is to prevent the ability for duplicating original cards and registering of random cards which will reduce the ability for abuse by the employees who submit the paid service.